The Committee continues to expect that the evolution of the economy will warrant gradual increases in the federal funds rate over time to achieve and maintain maximum employment and stable prices. That is a clear shift in policy focus. The policy objective went from attempting to achieve maximum employment to sustaining maximum employment to avoiding overheating. That runs counter to claims in the FOMC statement that the risks to the outlook are roughly balanced. Sustaining maximum employment suggests a balanced outlook. An objective of preventing overheating, suggests the risks are tilted toward inflationary pressures. Among the denizens of Constitution Avenue, the fear of falling behind the curve thus looks to be considerably higher than believed. 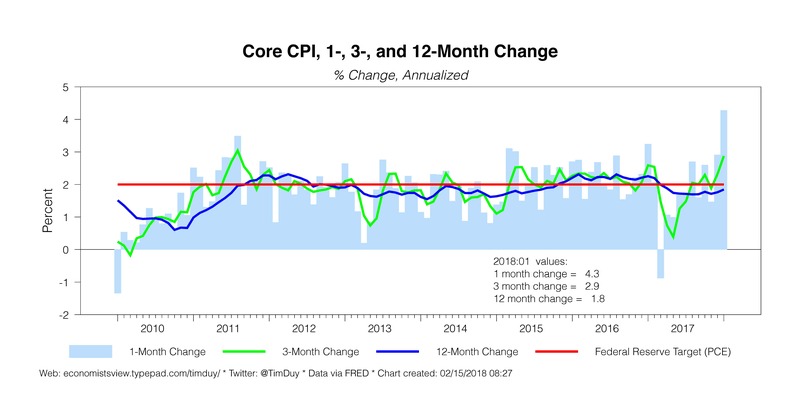 This shift to a focus on overheating is surprising given that inflation has yet to hit the Fed’s target. Apparently their confidence in reaching 2 percent or so this year has translated into fears of a substantial overshoot. That said, even with this change, the testimony reiterated the commitment to further gradual rate hikes. Gradual had come to mean three hikes this year, but with a risk of four. That risk is clearly higher now. That fourth rate hike, however, is not my primary concern at this point. 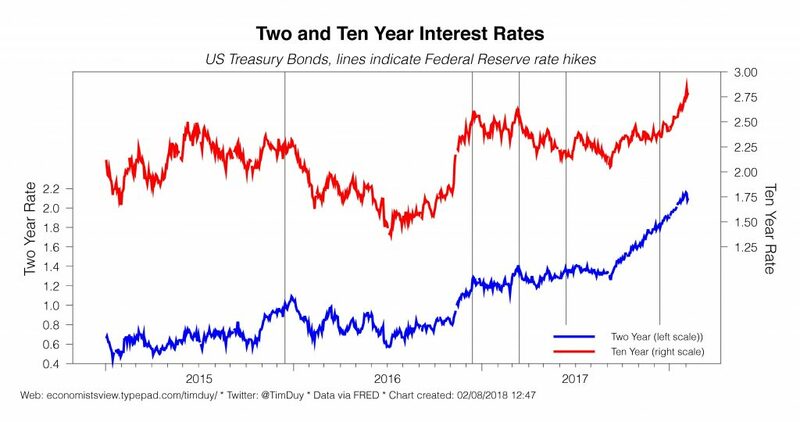 My primary concern now is that the Fed’s focus is on preventing overheating, the shift to an even more accelerated pace of rate hikes could occur very quickly. Also note that the testimony is written from the point of view of the FOMC. Hence, the shift to a focus on an overheated economy should reflect a consensus viewpoint. I don’t that recent Fedspeak reflects such a shift. I am thinking there was an internal decision to let Powell raise the overheating concern so the new Chairman could anchor policy expectations. I think we should be looking for other Fed officials to be using the overheating language, and I ask that financial journalists push on this issue further. Powell appears to be less concerned about such influence. He must know that market participants will shape their expectations on his statements over all others. And that setting those expectations helps set policy outcomes. That suggests three possibilities to me. The first is that Powell intends to shape policy more directly. The second is that Powell is taking more control over the messaging. The third is that Powell revealed more than he intended and will be more circumspect in the future. I am not going to prejudge any such shift. I have long lamented that Yellen did not take a more public stand on her policy leanings and that the Fed would benefit from a stronger communications anchors. At this point, I only raise the issue that Powell’s approach to his role will differ from his immediate predecessors, perhaps more so than expected. Bottom Line: What of the implications for policy in the wake of Powell’s visit to Capitol Hill? If the testimony reflects the views of the FOMC, and the FOMC’s concern has shifted to overheating, then the odds are high that enough dots shift up in the next Summary of Economic Projections that the median dot shifts to from three to four (I may have been too sanguine on this issue). Second, the median dot for 2019 will likely shift up to a firm three. But most important is that policy may now be on a hair trigger more than I anticipated. In my opinion, policy expectations have been somewhat set adrift by the leadership change at the Federal Reserve. We lack an anchor until Powell delivers a substantive policy speech. There exists a broad expectation of policy continuity, but that has so far gone unstated. Market participants are looking for Powell to firm up that expectation this week. 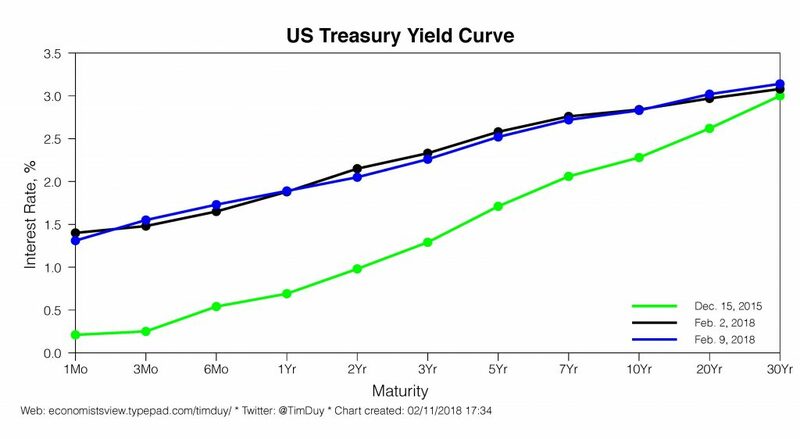 The concern is that Powell suggests an accelerated pace of rate hikes. Market participants are comfortable with the idea of four hikes, but not five or more. And in some sense it is fairly easy to tell a story that gets to five or more hikes. In the minutes of the last FOMC meeting, we learned that policymakers saw a stronger fiscal impulse than expected in December. Since then Congress and the Trump administration delivered a spending package with additional fiscal stimulus. This will add additional fuel to an already simmering nearly full-employment economy. Consider this additional fiscal stimulus in light of the Fed’s current forecast. They already believe they have overshot full employment and will need a restrictive monetary policy by 2020 to quell inflationary pressures. The economy is thus arguably already in a danger zone; the Fed has not proved successful in guiding unemployment higher without triggering a recession. That suggests that the Fed is already not sufficiently preemptive with policy. An expectation of three hikes was already too low, hence with additional fiscal stimulus four is also too low. Go big or go home. But even if Powell believed something along these lines, would he reveal this week that he expected to accelerate the pace of rate hikes? That I think depends how much forcefully he intends to guide policy. Does he intend to publically project the FOMC consensus in that he builds that consensus internally and then relates it to an external audience? Or does Powell intend a more authoritarian approach we haven’t seen since the days of Alan Greenspan? I see no reason to believe that Powell wants to break with the current style of consensus building within the Fed. I also don’t think that the consensus has changed. Fed speakers have in recent weeks reiterated the case for gradual policy tightening, not an acceleration. Hence, I anticipate the Powell will not go rogue with a different message. If he does shift gears, that would signal to me a very different leadership approach compared with Ben Bernanke and Janet Yellen. If the economy accelerates faster than currently anticipated, due to either fiscal stimulus or other factors, we will recalibrate policy as appropriate to meet the objectives of the dual mandate. Additional fiscal spending suggests the economy will not slow as much as anticipated next year and thus increases the likelihood that further gradual rate increases will be necessary through at least 2019. I tend to think 2019 is a good space to work with given still low rate hike expectations for next year. Consider market expectations for US policy rates in the below chart from Gavyn Davies at the Financial Times. If these truly represents market expectations for 2019, then in my opinion Powell has plenty to work with if he wants to add a hawkish lean to the outlook. I very much doubt economic activity will slow sufficiently to bring rate hikes in 2019 to a virtual standstill, especially in light of the additional fiscal stimulus. I think we would need to see a much greater pace of rate hikes in the first half of this year to bring about such a result. Bottom Line: I expect that Powell will emphasize policy continuity during this week’s trips to Capitol Hill. That means further gradual rate hikes with the actual outcomes being data dependent. The basic outlook thus should be consistent with current policy expectations of three or four rate hikes. Fiscal stimulus could be addressed within the context of data dependence or the 2019 forecast without raising expectations of a faster pace of rate hikes. If Powell goes rogue with a noticeably more hawkish message, then we have reason to consider this a very different leadership approach relative to his predecessors. After peaking at 10 percent in October 2009, the unemployment rate fell rather steadily to 4.1 percent in January–the lowest level, outside of a period from 1999 to 2000, since the 1960s. Job gains in recent months have continued at a pace that would be pushing the unemployment rate even lower if the labor participation rate had not stabilized in recent years, a welcome development and a sign that the strength of the labor market is pulling in or retaining workers who might otherwise be on the sidelines. Broader measures of labor market slack–for example, those that include individuals who are out of the labor force but say they want a job as well as those working with a part-time job but who would like to work full time–have largely returned to pre-crisis levels. While the labor market has shown steady improvement over the past decade, the post-crisis performance of gross domestic product (GDP) growth has been more disappointing, averaging just 2 percent per year over the past seven years. However, beginning with the second quarter of last year, growth has shown some momentum. Over the past three quarters of 2017, real GDP increased at an average rate of almost 3 percent. While headline growth stepped back a bit in the fourth quarter, largely on account of increased drag from higher imports and lower inventories, underlying final private domestic demand–which is a better indicator of economic momentum–grew at its fastest pace in more than three years. The tax and fiscal packages passed in recent months could help sustain the economy’s momentum in part by increasing demand, and also possibly by boosting the potential capacity of the economy by encouraging investment and supporting labor force participation. Notice the modifiers – the fiscal stimulus “could” help sustain the momentum. That suggests an unwillingness to commit to a sizable boost in the forecast. And even if there is a demand boost, that might be matched with a supply side boost. Regardless, given the importance of productivity growth for the long-run potential of the economy and living standards, it is vitally important that policymakers pursue policies aimed at boosting the growth rate of productivity. Against this economic backdrop, with a strong labor market and likely only temporary softness in inflation, I view it as appropriate that monetary policy should continue to be gradually normalized. I think this is not a bad experiment to run. If the Fed wants to see what happens if you run the economy hot, best to give it a try in a low inflation, well-anchored inflation expectations environment. If the economy overheats and sends inflation to 3 percent, it wouldn’t be something the Fed couldn’t control. I am willing to endorse that experiment. That said, I do find it interesting that Trump’s appointee quickly lands on a story that just happens to undermine the monetary offset story. If you want to run a late-cycle fiscal stimulus, you need a Fed that is on board with that policy. If this is an indicator, Trump’s appointees will lean to the dovish side of policy. As usual, his outlook is data dependent. Should the recent data unfold in a manner similar to my outlook, I am comfortable continuing with a slow removal of policy accommodation. However, I would caution that that doesn’t necessarily mean as many as three or four moves per year. Recent evidence suggests that the interest rate that would prevail when GDP and inflation are back on target could be close to 2 percent at the moment, and may rise only modestly over the medium term. If this is right, then the current stance of monetary policy is still somewhat accommodative but is approaching a more neutral stance. 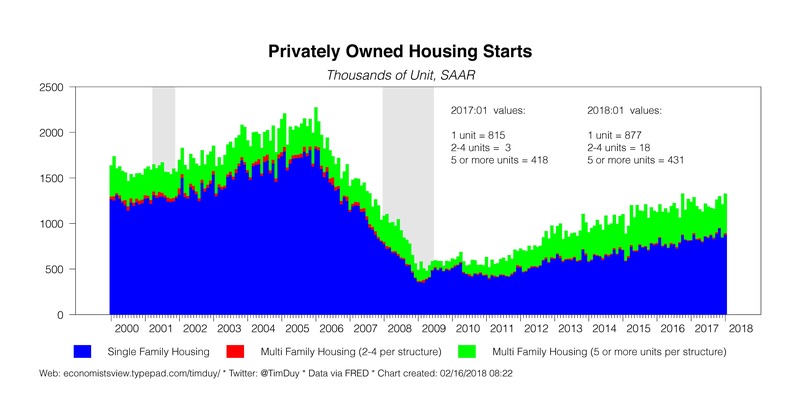 Finally, it is important to remember that the Fed is also removing accommodation by shrinking its balance sheet. Bostic is emphasizing that “gradual” isn’t just three or four hikes this year; it could be less, citing a low level of neutral interest rates. And that sounds like the direction he is leaning. In my opinion, he may not be placing sufficient weight on the risk that the neutral rate is already moving higher. But his opinion is of course the more important one – he is the FOMC voter this year. Hiking rates by a total of 1 percent this year, which would signal four increases of the typical 0.25 percent, would be “priced for perfection,” Bullard said. I am wary of placing too much weight on Bullard’s sentiment. The St. Louis Fed’s economic model colors Bullard’s outlook. 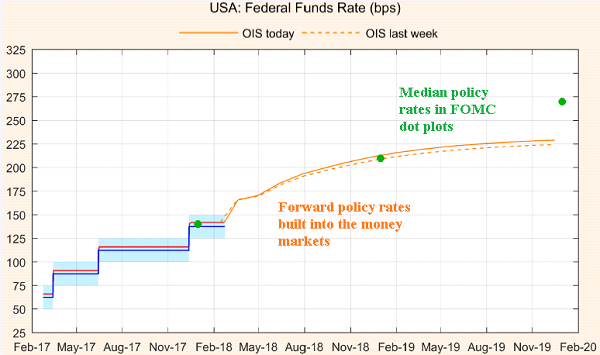 That model is an outlier approach within the Fed, hence not particular insightful for understanding the likely direction of monetary policy. Basically, everyone is more hawkish than Bullard. That said, he obviously isn’t trying to pull the FOMC to a more aggressive rate path. My position on Wall Street’s gyrations remains unchanged. Until late last year, the risk of higher interest rates was underappreciated. It wasn’t until the fall that the realization started to sink in that the Fed was nowhere near calling it quits. The economy was normalizing faster than anticipated. The wounds of the financial crisis were healing, leaving the stage set for the best economy since the late 1990s. Stock prices, however, did not reflect this new reality. 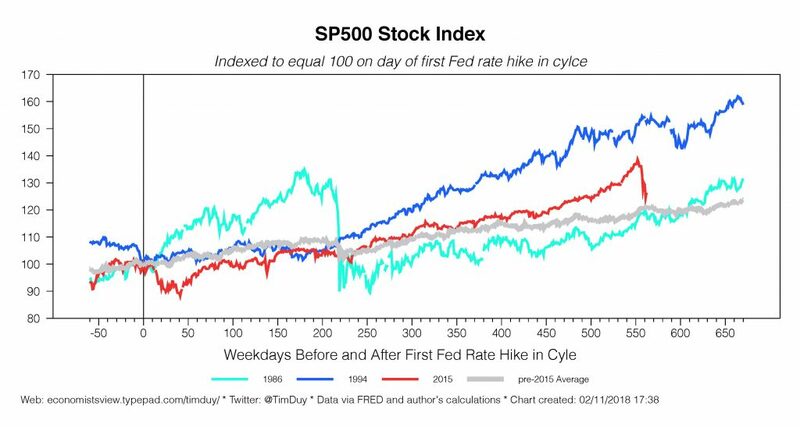 Even a partial normalization of interest rates would require a repricing of equities. The gains in stock prices in recent months were excessive. A correction was not unexpected. The spark for that correction appears to have been a solid employment report (although it is reasonable to say that we never really know why the psychology shifts). I think that the shock to Wall Street is more likely than not to be contained to Wall Street. This looks more to me like 1987 than 2007. Indeed, I think this shock has a silver lining in that it might extend the length of this expansion. Central bankers appear to feel similarly – the hit to stocks to date has yet to meaningfully impact their forecast. This is the message they want to push to sustain expectations that another rate hike is coming in March. See San Francisco Federal Reserve President John Williams, who I think lays this out nicely in this speech. Logic would point us in the same direction even without policy maker guidance. Note that the Fed did not raise their rate hike expectations in light of the positive shock to equities over the past couple of months. An offsetting negative shock should then not cause a change in forecast either. We also know from the Fed minutes that some officials were concerned about the possibility of a drop of equity prices and the potential negative implications for the economy. These individuals will likely take comfort in some steam coming off of financial markets. Better a small hit than a 1987-like crash. Other officials saw high equity prices as reflective of very low neutral rates. They will see then see lower equity prices as a natural consequence of rising neutral rates – something that both looks to be happen and is consistent with their forecast. Indeed, I would add higher long-term rates give greater credence to the Fed’s rate forecast for this year and next. 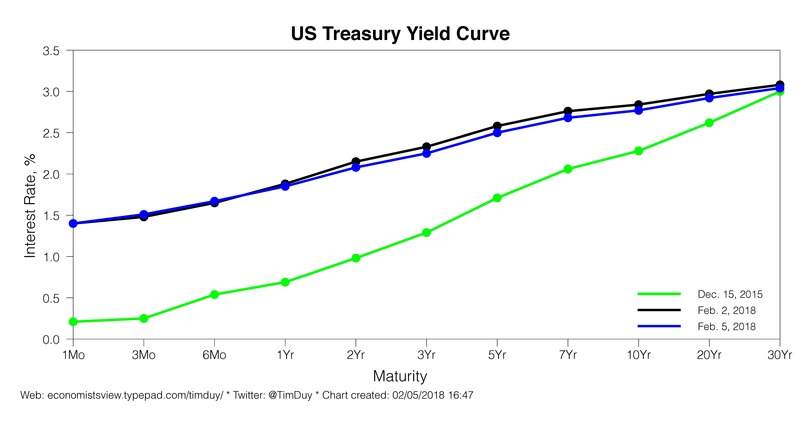 Chasing the long end of the curve is exactly what is needed if policy rates are going to return to something much more “normal.” Watch the very long bond – the anchor of the 30-year yield is slipping. All of that said, I am not sure I would, like Dudley in the quote above, dismiss the market move as “small potatoes.” A ten percent swing in prices is going to hurt someone. Someone is on the bad side of a leveraged trade. How big and how bad, I don’t know. What I do know is that small events can balloon into larger problems. I don’t think that is the case in this instance, but neither did then-Federal Reserve Chairman Ben Bernanke in 2007. The lesson from then should have been that policy makers are wise to approach this things with a bit more humility, at least in public. The further the financial crisis fades into the past, the more lessons will be forgotten. I suspect the challenge for the Fed will be to keep market participants focused on their medium-term forecast. If, as many believe, wage growth and inflation make an appearance this year, the Fed will have the opposite problem from 2017. Then they struggled to keep the focus on gradual rate hikes despite disappointing data. In retrospect, I think the dovish policymakers did us few favors last year, tamping down rate hike expectations that then were quickly reversed in recent weeks. In 2018, we should be cautious of the opposite, of rising rate hike expectations (to four and beyond). To be sure, this is the risk to the forecast. 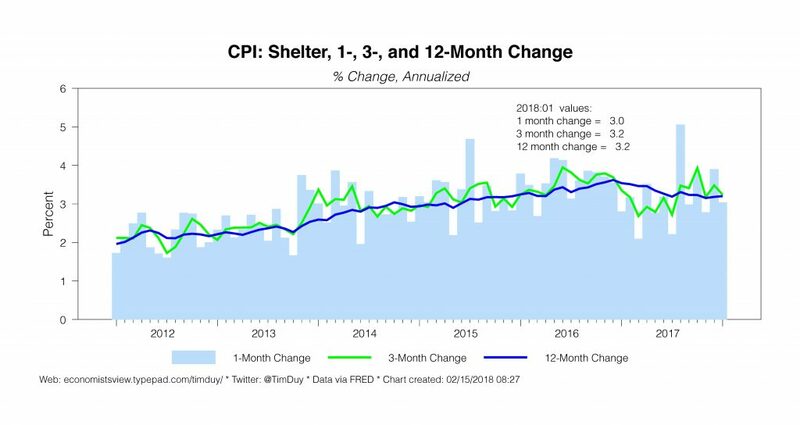 But policymakers will likely send a message that they will not overreact to higher inflation just as they did not overreact to lower inflation in 2017. I don’t think anyone could be faulted for believing that two percent is a ceiling, not a target. This would be the opportunity for the Fed to disabuse us of that notion and prove that the inflation target is symmetric. I suspect this message would be well received by market participants fearful that the Fed is going to accelerate rate hikes at the slightest provocation. Bottom Line: Gyrations on Wall Street look to be best described as a negative shock that simply reverses a recent positive shock. If the latter did not have time to feed through to the broader economy, then the former will have limited negative impact. 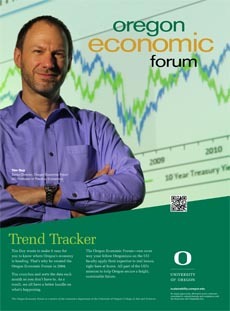 Unless that situation changes, keep an eye on the economic forecast for signals on the likely path of monetary policy. In particular, watch for policy makers to emphasize the symmetric nature of their policy target. This is potentially the first time in a long time they can prove the target is indeed symmetric. They can maintain focus on the forecast and calm market jitters without glibly dismissing the possibility that last week proves to be the tip of an iceberg. The equity market resumed its slide on Thursday, taking the Dow and S&P500 down by 4.2% and 3.8%, respectively. Since the downturn in equities began, Fed officials have largely stuck to the party line – more rate hikes are coming. This should not come as a surprise. The magnitude of the declines still falls well short of that necessary to induce the Fed to change course, especially in the context of the recent pace of gains. That means that until losses deepen, market participants are on their own. My baseline interpretation of recent events: The US economic expansion not only continues unabated, but is currently riding a cyclical upturn. The momentum from that upturn looks to continue long enough for the Federal Reserve to realize its policy rate forecast for 2018 – and into 2019 as well. This message began to sink in last fall, showing up, for example, in a steady rise in 2 year yields. The reality of the situation set in more deeply after the solid January employment report with its surprise wage gain. That alone should have been enough to encourage market participants to see that the economy was in some sense “normalizing” as the scars of the financial crisis healed, allowing the Fed to continue to raise interest rates. Adding to this environment is a tax cut and now a spending bill that look to widen the structural US deficit. Fiscal policy is thus set to add further fuel for an economy that is arguably already pushing up against full employment. The prospect of an overheated economy tilts the odds in favor an even more aggressive monetary policy stance. In short, interest rates needed to adjust to this new outlook. Note that this has long been built into the Fed’s forecasts, which assumed that neutral rates would rise as the financial crisis moved further into the rearview mirror. This appears to be what is happening. In the meantime, equity prices continued to rise relentlessly – the pace clearly had a frothy feel to it. A correction was likely to occur, and I argue that the sooner it occurred, the better off we will be in the long run. The employment report seemed to be the trigger for that correction. Recent price action between bonds and equities suggests to me that market participants are incorporating all of this information and in the process grinding out a new equilibrium that takes longer-term interest rates up a notch and equity prices down a notch. This makes sense to me in the context of an economy that has shifted into a mature phase. 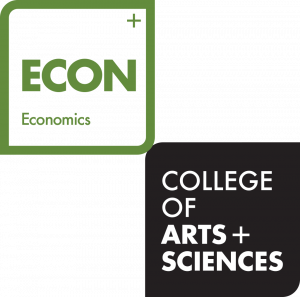 As the US economy moves closer to full employment, the constellation of prices in the economy will shift. Wall Street is a place where that shift happens. Within the context of this adjustment, however, lies a signal extraction problem. It is difficult to differentiate between a readjustment of pricing and a crash. Hence, there is a tendency to step aside until the dust settles. That tendency tends to exacerbate market turmoil. It takes some time for this kind of thing to sort itself out. For the moment, I don’t see signs of an economy going into overdrive or a bubble about to burst, so I have not adjusted my views of appropriate monetary policy. So my message to those concerned about a knee-jerk reaction from the Fed is that, as always, we’ll keep our focus on the dual mandate and let the data guide our decisions. This is clearly intended to tamp down fears that the Fed will suddenly accelerate the pace of rate hikes. While I think the risk is weighted towards more than three hikes this year, I also think that such a policy shift requires some real change in the medium-term forecast. Changes in the near-term forecast did not affect the path of policy last year. The same seems likely to be the same this year. And if anything, the market turmoil enforces the current forecast and reduces the risk of a fourth hike. Bottom Line: After many months of calm, we are now experiencing a painful readjustment. I think that pain is likely to continue until we sort out a new set of prices in the economy. The Federal Reserve looks set to allow that adjustment to continue unimpeded. They even seem to have expected the adjustment. For now, central bankers expect to maintain a gradual pace of rate hikes; it will take a much deeper correction – or evidence the correction to date is sufficient to trigger systemic damage in the financial markets – before they alter that that plan. The meltdown on Wall Street in recent days might have an upside: It could help extend the length of the expansion. I had three primary concerns about the extent of the equity rally of 2017 and the beginning of 2018. The first was that it could shift the Federal Reserve in a hawkish direction. The second was that it would extend beyond Wall Street to Main Street, heightening the risk that a market crash would spread through the broader economy. The third was that a selloff would derail the Fed’s interest-rate hike plans and even force it to cut rates. A more modest pace of gains would help ease these worries. In mid-January, well before the recent turmoil in financial markets, I wrote that although it is hard to bet against equities in the midst of an economic expansion, stock markets felt frothy, with excessive gains in recent months. That would have been a good market-timing call. A period of steady, good economic news, including data on U.S. wages that raised fears of a more aggressive Federal Reserve in the months ahead, helped trigger a shift in market psychology. The sell-off that began Feb. 2 turned into a rout on Monday. Not a particularly welcome event for the new Fed Chair, Jerome Powell. Well, that was unpleasant. But not completely unexpected. I don’t think it is possible to examine Monday’s action on Wall Street without the context of the last few months of rapid and virtually uninterrupted gains. Equity prices were easily outpacing historical gains during tightening cycles. And we even lacked the productivity story of the late 1990’s that helped drive gains during that period. In short, markets felt frothy. A correction was waiting to happen. As far as the exact cause is concerned for why the correction occurred Monday, there probably isn’t one. Leadership change at the Fed? Unexpectedly high wage growth? Political uncertainty? Perhaps none, or perhaps all contributed to the psychological shift that drove Monday’s wave of selling. 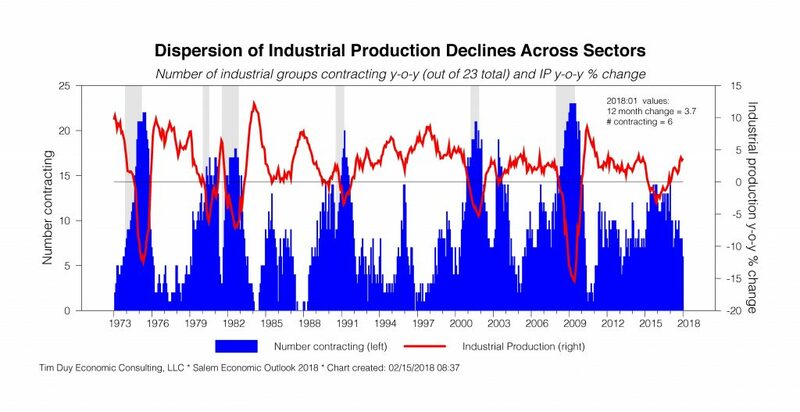 What I am fairly confident about is that the sell-off is more about correction for an overly fast pace of gains than a sign that the economy will likely turn the corner. Nor do I think the sell-off is of a magnitude that would materially change the outlook for the economy or monetary policy. This I think will be the message from Fed officials. My baseline scenario is this: The January employment report suggests that the economy is operating close to or beyond full employment. 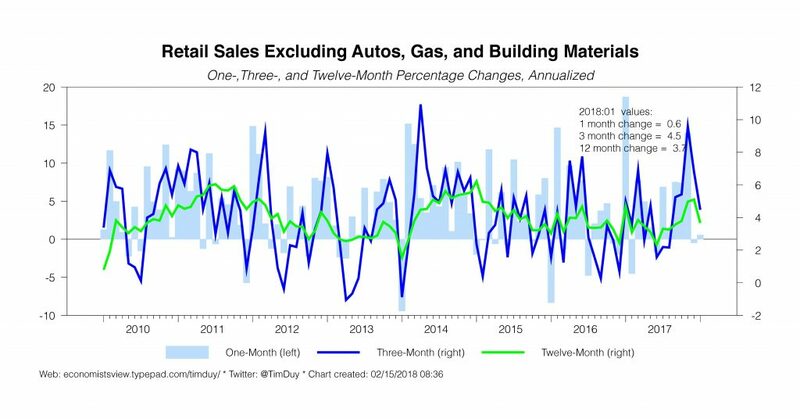 Moreover, incoming data such as the recent ISM reports on the manufacturing and service sectors are consistent with an economy that maintains solid cyclical momentum. That momentum will receive an additional boost from tax cuts. The implication for monetary policy is that the Fed is most likely to continue to raise interest rates. In the absence of deeper market declines, or the revelation that the declines are triggering systemic damage via leverage within the financial sector, the Fed will I suspect welcome the recent market declines. Taking the froth out of the markets early helps sustain the expansion will be the thinking. First, there is less likelihood the excess on Wall Street will spill over into Main Street as in the last two cycles. Second, policy makers will feel less pressure to raise rates to rein in financial markets. They can hold their attention to where it should be, the dual mandate. A less ebullient equity market will thus help reduce the risk of a fourth rate hike this year. That fourth hike now seems “less compelling.” That said, I still don’t believe equity prices would have been the driving factor in any event. The aggressiveness of the Federal Reserve this year will depend more on inflation outlook. The Fed will tolerate higher wage growth; what they won’t tolerate is a forecast of persistent inflation in excess of their target. Of course, getting policy right is easier said than done. The challenge facing newly minted Federal Reserve Chair Jerome Powell is navigating policy during a mature phase of the business cycle. Powell faces a mature economy that is closer to full employment than arguably any time since the last 90s. That is usually close to the tipping point in the business cycle. Typically, the Fed needs to continue to tighten policy to prevent overheating of the economy, but it is easy to over tighten and tip the economy into recession. Powell’s challenge will be to both keep snugging up on policy while both resisting calls to accelerate rate hikes late in the cycle and knowing when enough is enough – when to pull back from tightening. The last point is probably the most difficult due to lags in the policy process. This is a challenging position for any Fed chair. Bottom Line: Don’t panic just yet. Market declines do not appear tied to an earnings warning or recession threat (like 2015/206) nor are they sufficient to derail the expansion. In fact, you can argue that at this point they lengthen the expansion. What does it mean for monetary policy? It’s not a fun day to start his tenure leading the Fed, but it is still too early for Powell to be thinking about implementing the “Greenspan put.” Way too early. Fed officials will tell you they are watching financial markets but that the economic data still guides their policy decisions. Take them at their word. We need a couple of more days like this to change that story.